Welcome to Day 4 of my #100DaysofBulletJournalIdeas Project! This is a handy collection to log what you eat. Why is logging what you eat important? It's important for a lot reasons, and over time my reasons have changed. Increases your awareness of what you're nourishing your body with. Sometimes we lose track of time and end up eating rubbish excuses for food so by logging it we're holding ourselves accountable of what we're fueling our bodies with. You can see how different foods affect your moods. It's easier to pinpoint which food affected you if you have allergies or sensitivities. One of my very first iterations ever from way back in 2014! No real reason why the different colors on this page, I think it was just what I liked at the time. Reason I logged my food at this point in time: I started a collection I called my Food Diary, which I would later change to Food Log. I was just getting into the Bullet Journal at this point, so I went ahead and tried out Ryder's system by experimenting with creating a collection as a place to log my meals and I updated it whenever I remembered. At this point I decided not to 'save space' because I was trying to honor the system by filling it out as I went along. I put a smiley or a heart afterwards to indicate that I felt good after eating the meal. Here we see that I changed the name from Food Diary to Food Log. Here's a closer look at the smileys. I loved using the light gray Staedtler Triplus Fineliner pen to add subtle separations in my spreads. Here's around the time that I started to add a bit of structure by adding BLDS for Breakfast, Lunch, Dinner, and Snack. On the left-hand page I wrote down a simple list of meal ideas with a column of where said meal idea's recipe was located. On the right-hand page I had a weekly food log where I wrote down what I ate. Reason I logged my food at this point in time: To ensure that I was eating what I planned. 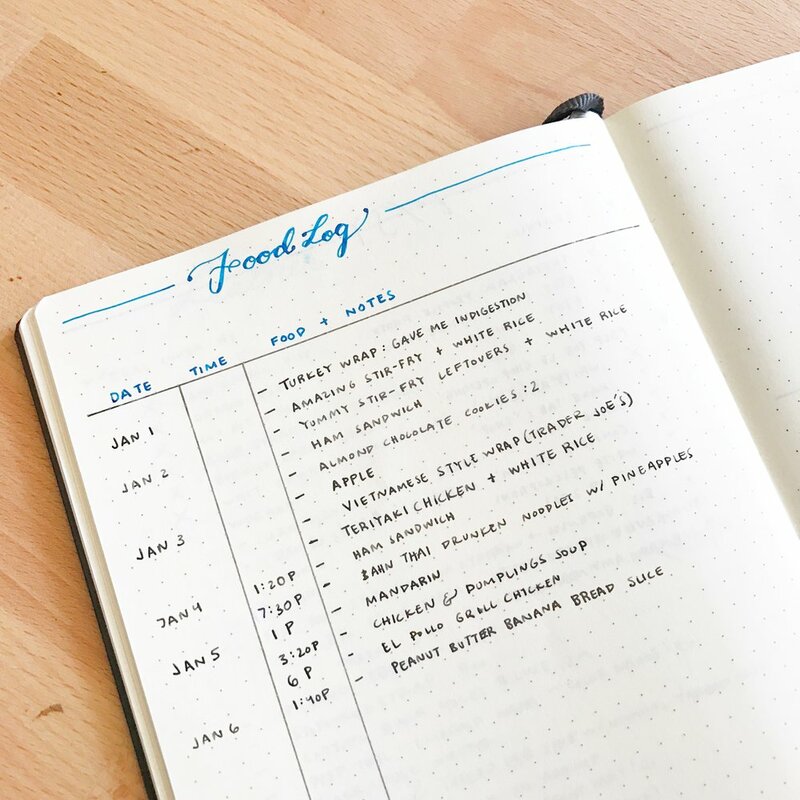 One of the first things I realized about the Bullet Journal was how powerful the Monthly Log is in its deceptively simple layout. 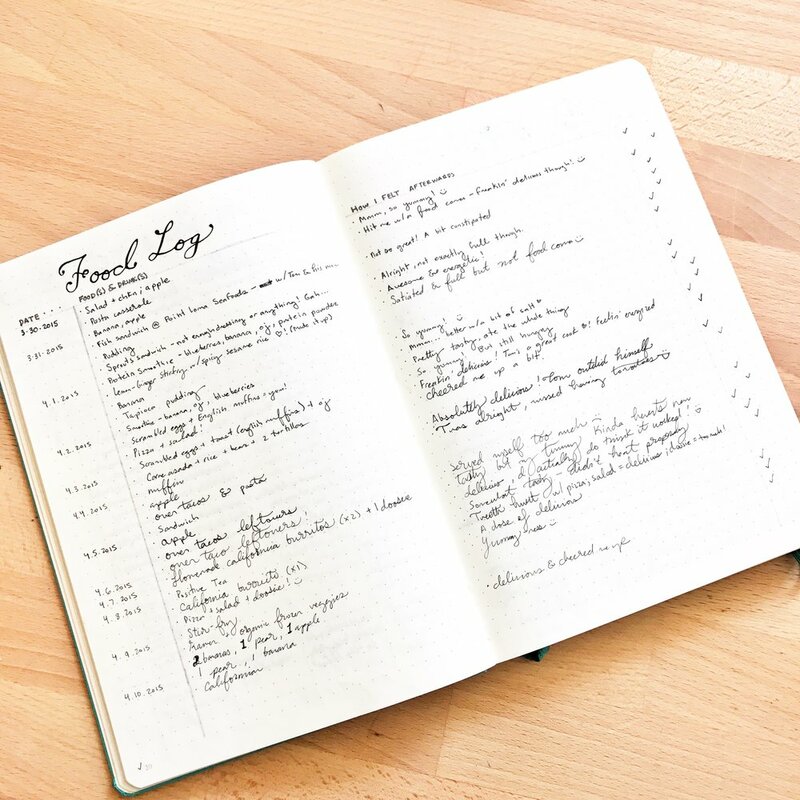 Given its genius, I realized that by expanding the days in some form I could add extra information in the form of all sorts of logs, which is how I got the idea for the Food Log, Gratitude Log, Sleep Log, Time Log, and more. 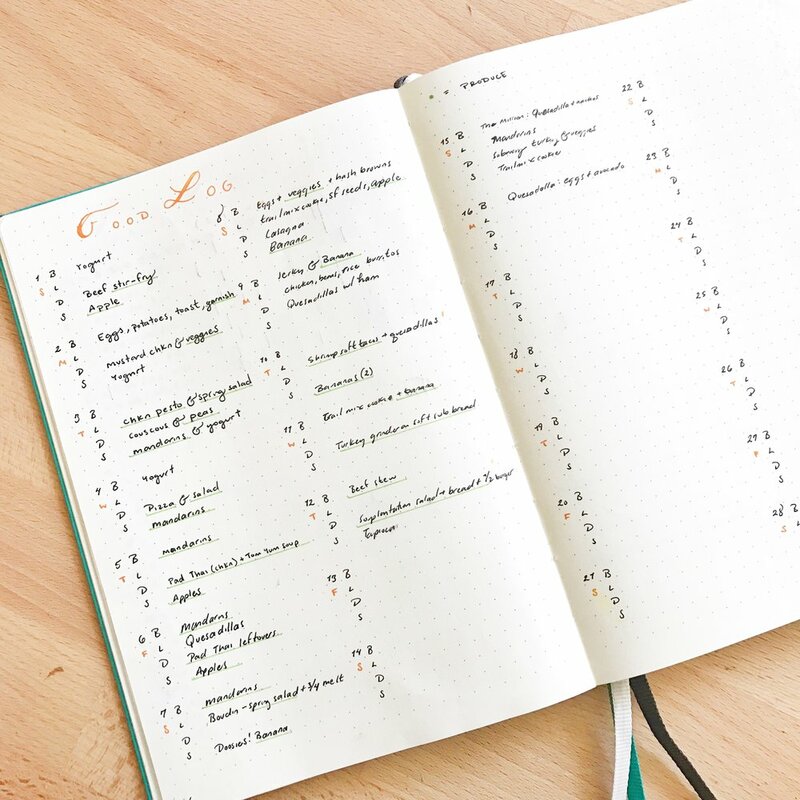 The Monthly Log's layout has an endless variety of possibilities. This is the spread that has inspired many Bullet Journalists to create their own food logs, it's been very humbling to see and I'm always happy when you tag me so I can see what you've created! Reason I logged my food at this point in time: Eating enough has always been a struggle for me, I usually get caught up whatever I'm doing and forget to eat. I started logging my food to make sure I was eating enough, and I was also curious about what I was eating so it helped to have it all in one place. Reason I logged my food at this point in time: Realizing how much food affects my moods, whether I eat a carb-heavy meal and fall into a food coma or wait too long to eat, I added a column to write down how I felt after eating. The bonus of doing it this way was that it helped me see which foods affected me positively and which ones sent me into headache or food coma mode. I now know that pancakes are dinner food, not breakfast - unless you guzzle down some coffee haha. I pretty much need a big nap after pancakes. This was a throwback to a looser, earlier iteration of a Food Log where I just updated the log when I actually ate. Reason I logged my food at this point in time: I was curious about what times I was eating and to see how long I had gone between meals or snacks. Like I mentioned before, remembering to eat for whatever reason is a challenge for me. I get the hungry cues, but when I'm immersed in a project I tend to ignore them unfortunately. Reason I logged my food at this point in time: At this point in time I was VERY active. I had gotten very into cycling so I was cycling my little heart out as often as I could. I was also trying out new experiments with my health and fitness and decided to set some nutrition goals and created this spread that aligned with my goals. I kept track of my food and exercise with an app and logged it in my Bullet Journal at the end of the day to be able to see it all in one place. Calories consumed & burned. The key is at the bottom of the page, the squares meant how many calories I ate and the dashed lines meant how many I burned. Just look at day 11! I pretty much burned all the calories I ate that day. Macros: I figured out a plan for how much of each I needed to eat and wrote down what I aimed for with each at the bottom of the page (Carbs 50%, Fat 30%, Protein 20%). Food Log: To write or draw what I ate at a glance. How I felt: Whether I felt good or not so great overall with what I had eaten. Nutritionally, this spread was awesome. I did manage to increase my Protein intake overall because I was more aware of it so I made it a priority to eat snacks such as jerky since those are high protein, low fat. Increasing my protein intake was important to me to help support my muscle growth with all my cycling, as well to help sustain my energy throughout the day. I personally think apps and the Bullet Journal work perfectly together, this is definitely an example of how they can work together. Reason I logged my food at this point in time: I was curious to see if I was consuming a healthy amount of veggies and fruits. I used a green Staedtler Triplus fineliner to underline when I ate produce. I improved the design of the Food Log by keeping it to one spread, this would allow me to see the full month on one page. Having month-long collections on one spread are handy to see a topic across the span of a month in one place. We arrive at the current month. This is my latest iteration of my Food Log. Reason I'm logging my food at this point in time: More or less the same reasons as before, just curious about how I'm eating. This time I have a section to the right where I can check off which meals I had that day. I've also logged my meals in my daily logs, that's actually what I did first, but I kept forgetting to log them there. Different strokes for different folks, I guess! I think this is more likely to work for you if you set up a little section first thing in your Daily Log to log your meals. When I took the time to do that, it was a breeze remembering to note down my meals since it was something I had in view at all times. That's how Ryder does it and it works for him. I've tried a lot of different apps to log my food as well. Apps are really helpful to see the true details, but nothing beats pen and paper when you want a simple, bird's eye view with the exact categories and information you want to keep an eye on. I recommend keeping a Food Log to learn about your eating habits and improve based on what you learn. Figure out your 'why' for keeping a log of your food, don't just do to do it or because others are doing it. Logging mindlessly won't help you learn anything and might turn out to be a waste of your time if you don't have a reason for why you're doing it. It might help to write down you reason somewhere on your spread if you need the visual reminder, I do this with some of my spreads. Also, as you read, motivations and reasons change - that's perfectly normal. You might not even find the value in logging your food now, but may change your mind later on. That's fine, it has to make sense to you. P.P.S. 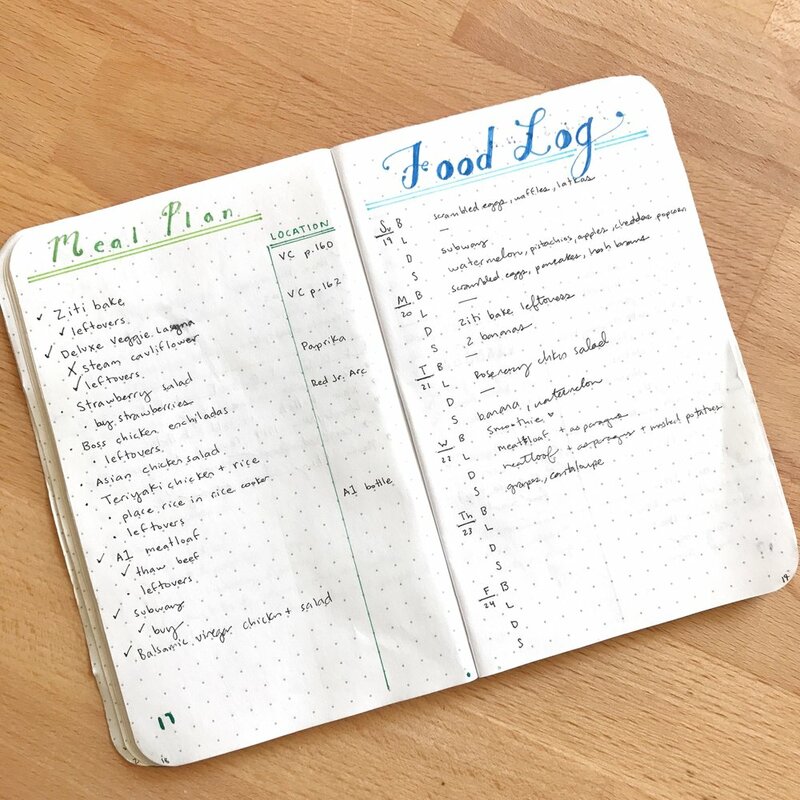 Wasn't it fun to go down memory lane with me seeing all my different Food Logs over time? This is definitely one of the reasons I review my old Bullet Journals all the time, there's always something new to learn from old ways of thinking that you can apply, or improve on, in the present.